You know how great your own mouth feels after an annual dental clean? Now, imagine if you didn’t brush your teeth for the next year. How healthy would your mouth be? It is no different for your pet. There are two major differences between you and your pet’s dental health and care; your dog suffers in silence and depends on YOU to take care of its health. The healthymouth™ water additive patented formula contains 100% human grade natural ingredients. healthymouth™ water additive is free of all synthetic, artificial ingredients, alcohol and contains NO added alcohol, xylitol, sugar, fat or sodium. The safe, effective, highly palatable concentrate formula (backed by a 100% refund policy) healthymouth for dogs and healthymouth for cats is added to your pet's daily drinking water - as easy as giving routine hydration - making dental home care a win-win for your dog and you! Oral examination, professional dental cleaning with intra-oral radiographs followed immediately by daily, continual and long-term use of healthy mouth™ work together as the most scientifically proven to date, safe, simple and comprehensive dental care program available today.Definitely, the best and most important investment you will ever make for your best friend. healthymouth™ is distributed in Australia by Cenvet Australia Pty, Ltd.
healthymouth™ is distributed in New Zealand by kVet Systems, Ltd.
Periodontal disease is a very common and often painful experience for dogs and cats. It is caused by plaque – not tartar. Plaque is a sticky film of bacteria forming a sticky film that builds up on your pet’s teeth. 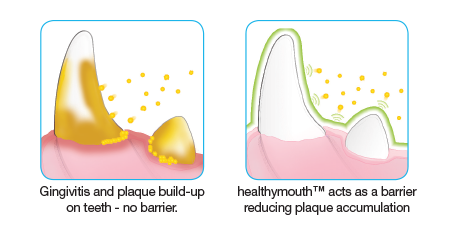 The bacteria in plaque cause tooth decay and gum disease eventually ending in tooth loss, if accumulation is not prevented and treated. Once periodontal disease is present it can’t be reversed. It often leads to the extraction of teeth which is painful, causing discomfort for your pet & costly vet bills. It is much easier to prevent periodontal disease than to manage it once established. After a dental procedure plaque can start to accumulate rapidly within a few hours, if nothing is done to prevent the plaque build-up. Daily home plaque control is essential to keep your beloved pet’s mouth healthy and reduce vet dental bills. healthymouth is only available for purchase through your local vet. Updated on 2018-11-29T15:44:26+10:00, by Brendon Short.